A significant part of the Star Trek phenomenon is “fan fiction.” The movie Star Trek of Gods and Men, jumps the fan fic phenomenon up a few notches from the more common zines or home movies. In addition to high quality sets and effects, the movie includes various people who have worked on the multiple Trek series, most notably Nichelle Nichols (Uhura) and Walter Koenig (Checkov) both from classic Trek. Seeing this movie I was again inspired to wonder again why the recent theatre release movie didn’t opt for a real Star Trek movie with real Star Trek actors, instead of the ‘tribute band’ movie they went for. During the production of the original series, Nichelle Nichols almost left Star Trek as it seemed that every time a scene needed to be cut from a script, to keep the episode from going over time, that it was a scene of Uhura that was cut. I expect that she was quite happy to be a part of Of Gods and Men, which features Uhura quite prominently. Tim Russ similarly seemed happy to appear next to Nichols and Koenig, revising his role as Tuvok, from Star Trek Voyager. Tim Russ directed Of Gods and Men as well. Numerous other actors from the various Trek series appear in this movies, some as brief cameos, and some with more substantial parts. The original Trek lacked the detailed episodic constancy and multi-episode story arcs of later series such as Babylon 5 and Buffy the Vampire Slayer. 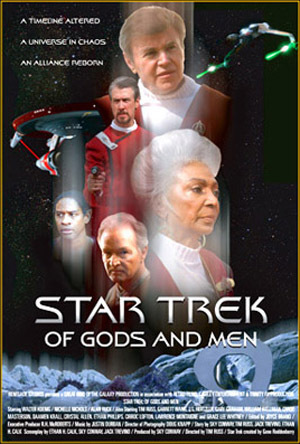 Of Gods and Men by contrast used the events of the earlier Trek episodes as back ground material, and tied a number of things together from the series. Fans of the minutiae of the Trek series will thus likely get extra enjoyment out of the movie. Of Gods and Men can be seen online at, www.startrekofgodsandmen.com, on YouTube, or DVDs of it can be purchased at the above URL. Originally published in Neo-opsis issue 20..